Based in New Jersey, The New Concinnity Faucet Company continues the legacy of a thought to be defunct concern. The original Concinnity was founded in 1986 and operated for almost two decades. In this time, they gained a reputation for luxury, quality, and innovation in faucet manufacture. They ceased doing business in 2004, to the detriment of the industry. Now, the brand has been resurrected as The New Concinnity Faucet Company by Kissler & Company, a venerable manufacturer with nearly 100 years of experience in the plumbing fixture field. No matter your aesthetic preference, The New Concinnity Faucet Company has a faucet to suit. If your style is more nostalgic, check out items from Traditional Collection such as the Vanderbilt or the Hermitage. They feature the warm and inviting looks of yesteryear with ornate embellishments. Faucets like the Vanguard and the Savoia from the Contemporary Collection sport clean lines and exude ultra-modernity. Finally, the Transitional Collection, which includes the Antilles and the Dansk, takes stylistic elements from both the Traditional and Contemporary Collections and subtly combines them. This results in faucets that will blend seamlessly into any kitchen design. The most beautiful design makes no difference without dependable quality. That's why The New Concinnity Faucet Company manufactures their products to the highest standards in the industry with the most cutting-edge plumbing technology. They are made from the finest and most durable materials such as polished chrome, satin nickel, and oil rubbed bronze. 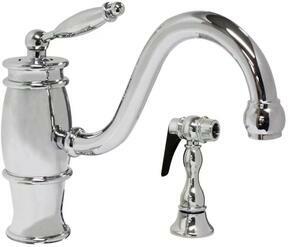 Make no mistake faucets from The New Concinnity are as robust as they are a delight to look at. Shop Appliances Connection today for the Concinnity that are right for you!